If you wish to study then banks offer you loans to make your dream come true. It all begins with writing an Educational Loan Request Letter which formally puts forward your request for student loan. It is a simple letter to the bank manager for education loan disbursement which talks about the course and university you plan to take admission in along with asking for details on education loan installment, repayment of loan etc. Some universities offer students option to write letter for education loan to college. There are various other letters on the same lines like letter for business loan to bank manager or authorization letter for bank statement etc. Have a look at the sample application for education loan format. 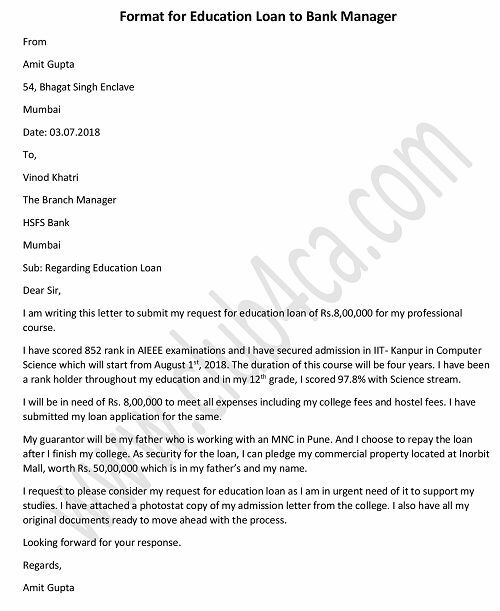 Use this template to write a formal letter to bank manager requesting for education loan. I am writing this letter to submit my request for education loan of Rs.8,00,000 for my professional course. I have scored 852 rank in AIEEE examinations and I have secured admission in IIT- Kanpur in Computer Science which will start from August 1st, 2018. The duration of this course will be four years. I have been a rank holder throughout my education and in my 12th grade, I scored 97.8% with Science stream. I will be in need of Rs. 8,00,000 to meet all expenses including my college fees and hostel fees. I have submitted my loan application for the same. My guarantor will be my father who is working with an MNC in Pune. And I choose to repay the loan after I finish my college. As security for the loan, I can pledge my commercial property located at Inorbit Mall, worth Rs. 50,00,000 which is in my father’s and my name. I request to please consider my request for education loan as I am in urgent need of it to support my studies. I have attached a photostat copy of my admission letter from the college. I also have all my original documents ready to move ahead with the process.